The conditions of the Robert Burns Fellowship state that it is open to writers of all genres with no expectation of output. The position is usually held for a year with a paid salary. An office is made available in the English Department, although some authors choose to work at home. In its 60 years, the Fellowship has become one of New Zealand’s most prestigious literary awards. 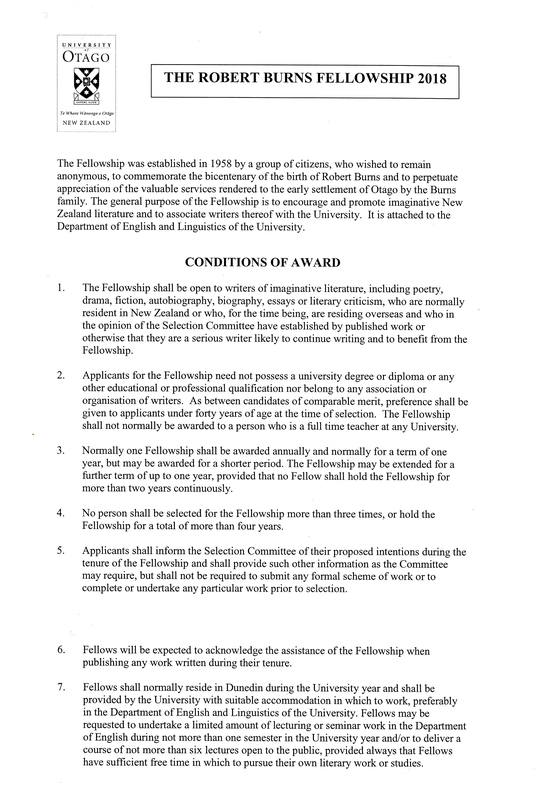 University of Otago, “The Robert Burns Fellowship 2018 Conditions of Award,” ourheritage.ac.nz | OUR Heritage, accessed April 26, 2019, http://ourheritage.ac.nz/items/show/10912.